Austin Lufkin of Brewer High School, pictured throwing the shot put at the PVC-Eastern Maine Indoor Track League Championships last month, is among three eastern Maine athletes competing this weekend at the New Balance Indoor Nationals meet in New York City. Three of Eastern Maine’s best track and field stars will perform on the national stage this weekend. 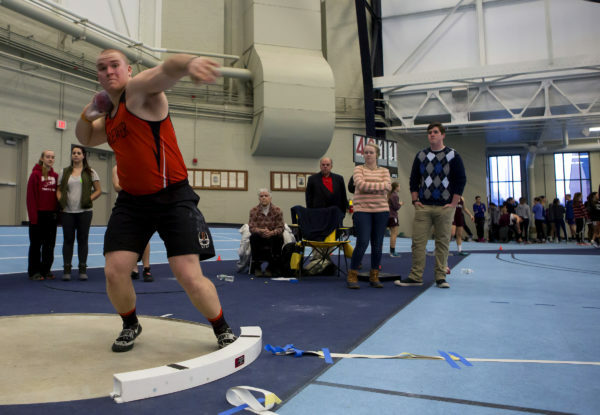 Brewer High School shot putter Austin Lufkin and Mount Desert Island distance runner Tia Tardy, both seniors, will participate in the New Balance Indoor National championship meet at The Armory in New York City this weekend. In addition, Cayden Spencer-Thompson of Lincoln, a sophomore at Mattanawcook Academy who does not compete on the high school team, will participate in the triple jump. Tardy will compete in the “emerging elite” mile run at 3:05 p.m. on Saturday and will run in the “championship” 800-meter race on Sunday morning at 10:10. Athletes must reach certain qualifying standards to compete in the emerging elite and championship divisions of the meet. Lufkin will throw the shot put in the championship division at 5 p.m. Saturday, while Spencer-Thompson is scheduled to compete at 10 a.m. Sunday in the championship triple jump. The sophomore is the youngest triple jumper in the championship field, and his personal best is 46 feet, 3 inches this winter. Lufkin has enjoyed one of the best seasons in the history of Maine track and field, shattering records nearly every time he enters the shot put circle. Lufkin, who earlier this winter committed to play football and participate in track at Wofford University, re-wrote the Class A and PVC-Eastern Maine Indoor Track League record books this season, becoming the first thrower in league history to break 60 feet in the shot put. At the Class A state meet, he shattered a state record that had stood up for four decades, and went on to stand atop the podium at last weekend’s New England championships, throwing 61 feet, 9½ inches in besting his nearest competitor by eight feet. Lufkin is the eighth seed in the field of 35 throwers. Tardy returns to New York for the second consecutive year, and will double in the mile and the 800 with a focus on the 800. The Class B state champion in the mile and the 800 and New England runner-up in the mile will be in the second of three heats in the 800 and will be in the third and final heat of the emerging elite mile. Tardy said after her runner-up finish at New Englands in the mile she is hopeful for a personal best in that event. Her all-time PR is 4 minutes, 55.23 seconds, but she’ll be looking to utilize her speed in the 800. “Although my focus will be on the 800, I would definitely like to post a fast time and PR [in the mile],” Tardy said recently. Spencer-Thompson is the 14th seed among 25 boys in the triple jump, and is the lone sophomore in a field dominated by juniors and seniors.